Makes 25 squares. Note: Lining the pan with foil makes removal of the squares easy. 1. Heat oven to 350 degrees. Line 9-inch-square baking pan with foil. Use two sheets of foil, placing one on top of the other in perpendicular fashion to completely line the pan. Push foil into corners and up over sides of pan to provide an overhang (helps with removal of baked squares). Spray foil with nonstick cooking spray. 2. In a bowl mix flour, oats, sugars, baking soda, salt, and pecans at low speed until combined, about 30 seconds. With mixer running at low speed, add butter pieces; continue to beat until mixture is well-blended and resembles wet sand, about 2 minutes. In a separate bowl, mix together fresh raspberries and sauce. 3. Transfer 2/3 of oat/nut mixture to prepared pan and use hands to press crumbs evenly into bottom. Bake until starting to brown, about 20 minutes. 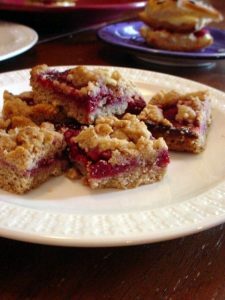 Using rubber spatula, spread raspberry mixture evenly over hot bottom crust; sprinkle remaining oat/nut mixture evenly over raspberries. 4. 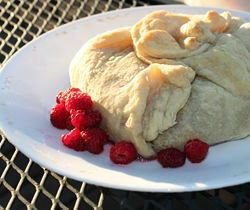 Bake until raspberry sauce bubbles around edges and top is golden brown, about 30 minutes. Cool to room temperature. Remove from pan using foil handles. Cut into squares and serve. 1. 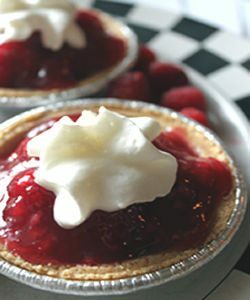 In medium saucepan, bring raspberries, 1/4 cup water, 8 tablespoons sugar, and salt to bare simmer over medium heat, stirring occasionally; cook until sugar is dissolved and berries are heated through, about 1 minute longer. 2. Transfer mixture to blender or food processor; puree until smooth, about 20 seconds. Strain through fine-mesh strainer into small bowl, pressing puree with rubber spatula (yes, it requires some pressing) to extract as much seedless puree as possible. Stir in lime juice and additional sugar to taste. Refrigerate until cold, at least 1 hour. Stir to recombine before serving. Can be refrigerated for up to 4 days. Great on ice cream, cheese cake, pound cake, chocolate tortes, French toast, and waffles. Great appetizer/dessert. Serve with your favorite artisan bread, e.g. ciabatta, french. 1. Toast pecans in a bit of oil. 2. Roll out puff pastry on lightly floured surface. Place brie in center. Top with fresh raspberries, brown sugar, and toasted pecans. 3. Pull 4 corners up and seal seams. Twist ends at top. 4. Place on cookie sheet sprayed with cooking oil. 5. Bake for 20-25 minutes until golden brown. 6. Remove from oven and let sit 5 minutes before serving.